The Null Device blog: Disney on Brunswick St. This could mean one of two things: either Disney are now adding their brand to the family entertainment experience that is Brunswick St., or it's not actually authorised by Disney, but rather is some form of détournement or "subversive" post-Warholean art project or something (possibly even a commentary on the sanitisation and commercialisation of Brunswick St.?). 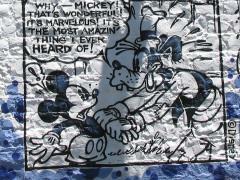 Disney and copyright ... copyright on Mickey was supposed to have run out a little while ago, but some wrangling in the US Senate c/- nut cultist Sonny Bono extended it another century or so.
" Back in 1998, representatives of the Walt Disney Company came to Washington looking for help. Disney's copyright on Mickey Mouse, who made his screen debut in the 1928 cartoon short "Steamboat Willie," was due to expire in 2003, and Disney's rights to Pluto, Goofy and Donald Duck were to expire a few years later. Rather than allow Mickey and friends to enter the public domain, Disney and its friends - a group of Hollywood studios, music labels, and PACs representing content owners - told Congress that they wanted an extension bill passed.